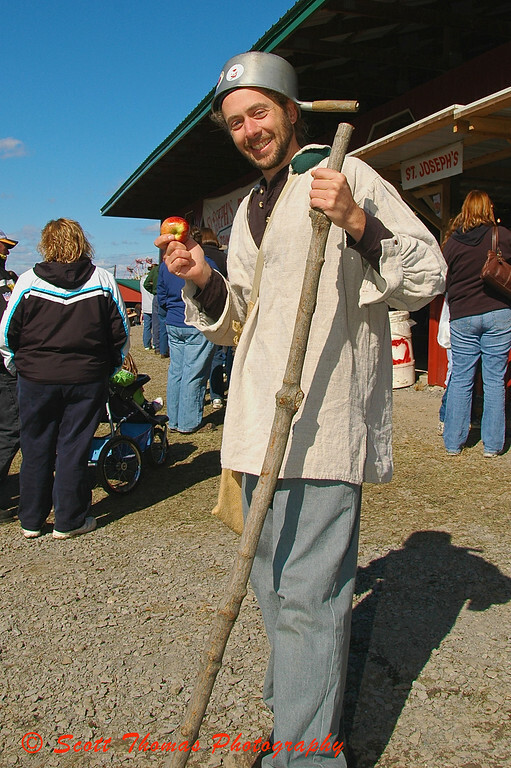 Johnny Appleseed at the LaFayette Apple Festival in LaFayette, New York. When it comes to fall festivals in my area, the biggest is the LaFayette Apple Festival. In two days, 50,000 people attend the festival to enjoy all kinds of apple goodies, carnival rides, craft tents and entertainment. All of this happens under the watchful eye of Johnny Appleseed. Whose legend of planting apple trees makes him a very suitable mascot for the popular festival. This entry was posted in Travel, Weekly View and tagged apple, festival, johnny appleseed, lafayette, new york, Photography. Bookmark the permalink. He’s an engaging Johnny! Nice to see autumn as it should be, with sunshine and apple festivals. The sun did pop out late in the morning and it was warm if you got out of the brisk north-west winds. The hot apple fritters (which I was eating when Johnny Appleseed showed up) helped to warm me up. Hmmm…I’ve seen many pictures of Johnny Appleseed which included the pot on his head. I’ll have to do some digging and find out it’s origin for you.